Costume season is quickly approaching! Halloween means lots of parties. You will need something to wear that will really set you apart. Perhaps you will be the Christmas star in a local play or production? You will need a real snazzy outfit to pull off your role. Whatever the reason, you can make your own costume. Here are some star costume ideas that easy to make and wear. Cardboard is a great medium for just about anything, including costume making. You'll need plenty of cardboard for the front and back of your body. 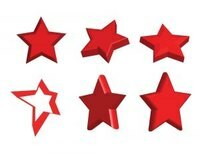 Print star clip art on to a transparency. Use an overhead projector to send the image onto your cardboard. Trace the star with a pencil. Do this twice because you'll need two pieces. Then use an Exacto knife or large scissors to cut out the stars. Use white spray paint to cover the both sides of the stars. Don't oversaturate the cardboard. After the paint dries, drill two holes in both your stars. These holes should fit over one another. Use silver ribbon to connect the pieces. Tie knots in the ribbon on both sides. The star costume should lay over your shoulders. This a two-part star costume. First, make the top of the star with poster board. Shape your poster board into a dunce hat and secure it with tape. Using glue, attach some silver wreath tinsel around the base. Then ask a friend to help you with the rest of the costume. You will need a flat white sheet. Cut a hole in the center and slip it over your head. Extend your arms and ask your friend to cut it in the shape of a star. After your star costume is cut from the sheet, use some spray paint and a star stencil to spray stars all over your costume. Using glue, attach silver tinsel around the edges and the neck. On the night of the party or event, use face paint to paint silver stars on your face. Purchase white foam sheet material from your local home-improvement store. You will also need a set of battery-operated Christmas lights. Cut a large star shape from the foam. Then carefully use a screwdriver to poke small holes around the perimeter of the foam. Carefully poke the Christmas lights into the holes. All the light bulbs should be facing the same direction. Tape the battery pack to the back of the star. Next, glue the ends of a white fabric strap, large enough to fit your body like a sash, to the top and bottom of the star. The night of the party or event, use stick picks to secure the top part of the sash to the star. It will hold just fine with the foam. Or you could just poke a couple of holes in the top of the star and hang it around your neck. Black clothing really sets off your light-up star costume.